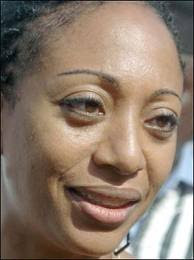 Samia Yaaba Nktumah is the only daughter of Osagyefo Dr. Kwame Nkrumah, Ghana's first President. The controversial multi-billion housing deal between the government of Ghana and STX Korea which has generated heated public debate suffered a major setback last Monday when both parties failed to sign the final working agreement, unexplained legal difficulties. “I would have voted against it if I were in the country then, because the whole deal is not right,” she said. Samia who represent Jomoro Constituency in the Western Region was not happy that the government did not believe in the capacity of Ghanaian companies and also not engaging the local expertise in the execution of the deal. She said the time has come for the government must stop depending on other countries for the nation’s development and concentrate on harnessing local expertise for nation building. The deal between the government of Ghana and Korea will see a Korean firm, STX Group providing 200,000 housing units at a cost of $10 billion for Ghanaians particularly the security services. Sources say the Koreans wanted to know how the money for the houses would be paid by the government of Ghana, with the changes in the earlier agreement where Ghana’s oil was used as collateral. Signing of the deal has been put on hold after a closed-door meeting between officials of STX and Vice President John Dramani Mahama, as well as some top government officials including ministers of state. DAILY GUIDE learnt that almost three hours after the media had set up their equipment in the well-decorated conference room of the Vice President’s waiting for the event, Deputy Minister of Information James Agyenim-Boateng, accompanied by John Jinapor, spokesperson for Vice President John Mahama, and Stanislav Xoese Dogbe, the embattled presidential aide, appeared and announced the cancellation of the programme. Agyenim-Boateng had attributed the cancellation to “legal issues that could not be resolved immediately at the last meeting before the ceremony”. “Certain legal issues cropped up at the eleventh hour and under the circumstances, we were compelled to cancel the signing until we receive advice from the Attorney-General’s Department where we have referred the issues to,” the Deputy Information Minister had told journalists.